ChildFund and Intel Corporation have partnered together to create a sustainable technology solution, which addresses an acute development need – the ability to efficiently and securely capture digital data in challenging environments, aggregate this data, and analyse the information in order to guide current and future development work. The Community Level Data Management (CLDM) Project utilises a transactional data transmission methodology, designed with Intel’s assistance, and will become a technology enabler for the entire organisation, from ChildFund Offices to their most remote global staff. The long-term goal is a more efficient, timely, accurate, and technologically innovative programme information and monitoring system that could have a direct and on-going positive impact on organisational administrative costs. During the spring of 2012, ChildFund deployed and tested two types of mobile applications on the CLDM platform. The first app, deployed to Intel-powered ultrabooks, enabled the collection of text-based child well-being data. Community Mobilisers in Dominica and Zambia were equipped with these ultra-portable computers, visited homes of ChildFund-enrolled children and their families, and, while offline, collected data on a number of evaluation factors including education, nutrition, emotional health, and access to health services. Once the mobiliser was able to connect to the internet again, this data was synchronised with a central database and the information was then wiped off the device. At any time, programme staff members, located anywhere in the world, could connect to the database and analyse the information as it was coming in from the field. The second application, developed for use by Android tablets and tested in an urban slum outside of Belo Horizonte, Brazil, enabled the collection of geospatial and image data. Digital photographs of handwritten letters from sponsored children to their sponsors were merged with child information and then securely sent to a temporary database located in the US via a field-based internet connection. Based on the successful tests in early 2012, ChildFund has now started to develop a fully-functional mobile application to collect and analyse its most critical child-centered data from around the world. This effort will fundamentally change the way ChildFund does business. Local data will become digitised, information will pass back and forth from the field to our National and International Offices at a much more rapid pace, analytics will be substantially more robust, and the foundation will be set for an even greater level of accountability to our donors. In addition, ChildFund’s organisational goals for the platform align with Intel’s ambitious vision for the next decade: Create and extend computing technology to connect and enrich the lives of every person on earth. Not only does the software technology save community mobilisers hours of additional work, it also saves ChildFund overhead administrative costs. This means more of the donation goes directly to the children – so that Theu in Vietnam can receive the medical treatment she needs, and Harriet in Zambia can learn to read. 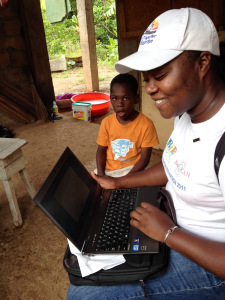 Community mobilisers like Clasia (pictured) use an Intel-powered Ultrabook™ equipped with a ChildFund-developed software programme to gather data on each child they visit – while they’re with the child, at home, at school, or even under a tree. The data is then transmitted to a central data base when a secure internet connection is in range. To date, the small-scale ChildFund pilot project has saved mobilisers about 40 hours, which could mean as many as 1,600 hours saved per project once the programme is implemented throughout Dominica’s network of 8,000 children. “The Ultrabook™ technology is especially suited for the work that these mobilisers undertake. It’s thin, lightweight, ultra responsive, and long lasting, which makes a big difference when you’re out in the field and responsible for reaching out to over 300 children,” says Ron Wolfe, senior business systems analyst at ChildFund. In addition, the data is better protected, more accurate, and accessible – a far cry from the stacks of paper files which used to take up precious space at their local offices. Now analysts at ChildFund are able to see data from a study population in hours – not weeks and months – and that allows decisions and strategies to be implemented while they still have the chance to make a difference. ChildFund plans to scale up its technology solution to all of its eligible teams in the next few years; when you consider they assist 13.5 million children and their family members, it’s easy to imagine the magnitude of impact this will have. In the end, it’s not really about vaccinations and textbooks – it’s about hope and the opportunity for a better future.